No one likes to say “no”, especially a landlord who is turning away a prospective renter in a tough market. But the pain of choosing the wrong tenant will outweigh the costs of a vacancy. Sometimes landlords have to be tough. The trouble with rejecting a tenant, though, is the likelihood they will take their hurt feelings to their lawyer’s office or the housing authority. Before the landlord realizes it, the next “prospect” who tours the rental is actually a “tester” conducting an investigation of their tenant screening practices. Fines and damages from lawsuits or housing disputes can range from the thousands to the hundreds of thousands, and even into the millions for widespread violations in large rental property businesses. Here’s how to reject an applicant without opening yourself up to legal liability. 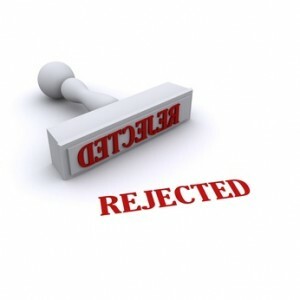 Often we want to say “No, no, it’s not you, it’s me.” Get in the habit of saying “Well, actually it is you.” Don’t try to sugar-coat a rejection, or you’ll talk yourself right into a legal tangle. Tell the applicant the reason for the rejection. This will offer them closure without the need for further legal action. If the rejection is based on something in the tenant’s credit report, you have a legal duty to tell them so. In addition, you must tell them which credit reporting agency gave you the information in the event they want to dispute the credit report. Landlords can reject someone outright for credit problems. You should, however, be prepared to justify how you made the decision. You must enforce the same credit threshold with every applicant. Discrimination occurs when a landlord refuses to rent to someone because of the impression they form about the person’s class, including race, color, religion, national origin, marital or familial status, gender, advanced age or disability. The best way to avoid a discrimination claim is to avoid questions about the person’s class during tenant screening . Instead, focus on that individual’s behavior. It is also advisable not to predetermine the “type” of tenant who they think would “fit in” to the property. There are countless ways to run afoul of this rule, for instance, touting the proximity of the rental to a religious institution, describing the ethnicity of the neighborhood, or suggesting who might like the neighborhood. Stating that a property is a good match for a young family or a single person are more examples of how a statement may be interpreted as discriminatory. Rejecting a prospective tenant because they are dressed in a certain way may also be considered discriminatory if a landlord uses pejorative words to describe it, for example, stating someone is dressed like a “gangbanger” can imply racial stereotyping and discrimination. Do not reject a tenant because they are a member of a protected class. On the other hand, a landlord is not required to rent to the person because of their class status. If there is a bona fide reason to reject them, like a poor credit report or a dubious reference from the previous landlord relating specifically to the payment of rent or behavior of that particular individual, a landlord does have the right to reject them. When making a determination about an applicant from a previous landlord or personal reference, be sure to stick to the same rules and only act on information that specifically relates to the person’s behavior, e.g. chronically late rent payments or disruptive actions, and not concerns generated from that reference’s own personal biases. Reject tenants with criminal history that could spell bad behavior as a renter – check fraud, disorderly conduct, for instance, and any violent or aggressive behavior that could place other tenants or neighbors at risk. Some landlords are willing to let minor offenses slide, like parking tickets or traffic infractions. Wherever you decide to draw the line, apply it evenly to all applicants. Tenants with a history of eviction can be rejected. The cost of an eviction is significant, not just in legal fees, but in time lost without payment of rent. A contested eviction can take months to resolve. Once an eviction proceeding is filed, the tenant may be more likely to damage the rental property, and those costs can be enormous. Landlords can reject an applicant who did not complete the entire rental application. Make certain that the applicant has signed the authorization for a tenant background check, including a credit report, and permission to contact the references listed. Keep documentation of your contacts with the applicant to prove you did not violate the law when you rejected the applicant. Most importantly, apply whatever criteria you use to reject or accept a prospective tenant evenly and objectively to all tenants. Elena Rivkin Franz is an attorney with Pratt & Associates in Campbell, California, specializing in business and real estate law. Call (408) 369-0800 or email Ms. Franz at efranz@prattattorneys.com for more information. “You were one of my top choice for tenant. But there were several other applicants just as qualified. So in the end I just picked a name out of the hat”. Per the article, landlords are legally required to alert the potential renter as to which credit reporting agency reported negative credit. Unfortunately, TVS does not provide this information to landfords — just a mysterious letter grading system. Please explain how we can comply with this legal requirement when TVS will not provide this information. Thank you. Hi Julie & Mo…TVS does provide the name of the Credit Bureau, it is at the top of each report, it says source Experian and when your order the report from the main menu after log in, it shows that you are ordering an Experian report. In addition if a member were to call Customer Service they would be advised that Experian Credit Bureau provides the report. Experian is the ONLY Credit Bureau that allows companies like TVS to give landlords & property managers a credit decision report which does not require a site inspection. Neither Equifax nor Trans Union provide tenant screening companies with a credit decision report. The grading system should be straightforward, as it indicates the potential for delinquency given a certain grade. i.e. Accepted Industry Standards indicate that A+ has a 1% delinquency rate A = 2% delinquency rate F = 87% delinquency rate etc. If you click on Recommendations at the bottom of the report, there is more information about the grading system which is helpful. The grading system and the Credit Decision Report in overalll allows you to determine credit worthiness . The Credit Decision Report includes an Applicant Verification from Lexis Nexis which should be used to determine the truthfulness of the applicant & number of moves in recent years. Compare the current & previous address on the rental application to the addresses on applicant verification. If you’re interviewing the applicant and asking questions about previous residences and cities lived in, compare that information to Lexis Nexis information. The Credit Decision Report is full of useful information that includes Tips in the Recommendation section to determine tenant worthiness. Unfortunately, identity theives have made it difficult to obtain consumer information in an easy manner. The TVS/ATS Credit Decision Report is the best that we could do. Most other Tenant Screening Companies do not offer a credit decision report and if they do it doesn’t include an applicant verification. There are many TVS/ATS landlords & property managers that are taking advantage of the Notice to Tenant found in forms section and reporting monthly pay habits. This sends a strong message to the prospective tenant and it reduces the risk of late payments and non payment of rent. As far as showing more information on a TVS/ATS credit decision report, that’s not likely to happen anytime soon, even though TVS/ATS have the most thorough sign up process in the country and identify members beyond a reasonable doubt. More comments on this would be appreciated. Can a landlord reject an applicant because of there smoking/drinking habits. Thank you for your thorough and detailed response to Julie and Mo. As a somewhat seasoned landlord, I’m suspicious of EVERYONE, including TVS and others offering services over the internet. What comes across in your answer seems to be a genuine effort to assist us. It is so hard to assess a persons commitment to the responsibilities of a lease agreement. And, that is what it should come down to. As a property owner I am loaning them eighty, to a hundred and eighty thousand dollars (in my case). Will I see that loan respected and serviced? That is the question. We, individual landlords, need just the sort of help your company appears to offer. Your response and these occasional news letters are good. They make your company seem more reliable and accessible. HELP we are landlors that never did credit checks on tenants before, and recently had to hire a lawyer to evict. Long story short, we have no idea on how to go about getting credit checks, what information we would need from them, what sites to look for credit checks companies? We didnt know that you could check someone elses credit/back ground legally. HELPANYONE, PLS. How can I reject a prospective client based on the sixth sense I get when meeting the person and feeling that their character is not desirable to work with. How do I refuse a tenant who fills out and submits a RTB10 form (assuming the prior owner’s tenancy) if his credit rating passes?